Associations - ongoing interaction proving valuable. Not to be undone, these entities provide some pretty decent networks to help well over 50% of buyers gain knowledge, and also access experts. For example, our network partner the Sourcing Interests Group hosts a regular stream of interactive webcasts and special interest group discussions to complement their events. They even make our research accessible to their members. Not bad huh? 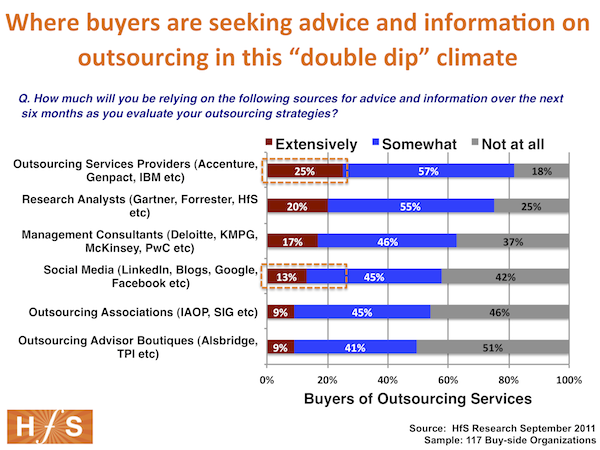 Outsourcing Advisor Boutiques - great for deal negotiations, but less so for the other stuff. Many clients today are turning to these guys once they are ready to pull the trigger on a deal, but it seems they aren't being as heavily utilized for general information and advice. Moreover, boutique advisors don't produce a lot of data and insight that is easy to digest, or freely available. Much of it is written in industry-jargon and their online content often reads more like they are writing to each other than their actual clients. Don't get me wrong, their content is often superb, but you sometimes need a PhD in the school of outsourcing hard knocks to understand it. The bottom-line is that many advisors simply don't see the revenue incentive to give anything away for free, and employ too many hard-nosed deal guys that can negotiate an indemnification clause and chaperone site visits during a selection process, but simply don’t know how to evolve a sourcing strategy. Buyers are savvying up on sourcing. There's a lot of information and advice out there today and a whole array of individuals and firms are willing to provide it. The common theme is that if someone wants the price of a SOX expert in Slovakia, or certification as to whether they'd be nuts handing off their paper-clip purchasing to a Polish procurement provider, they want that knowledge right away. The secret sauce that once obscured outsourcing information has long evaporated, and the challenge now for buyers is to make sure they have consistent, ongoing access to people whom they trust to provide it, without it costing the earth. Social is increasingly powerful as buyers start to seek each other out to exchange views and experiences. Plus, it's harder for consultants and suppliers to control the flow of information. Really like the post and really agree with your perspective and conclusions. Buyer / advisor / seller rules of engagements are changing rapidly and permanently. Isn't it really a question of what you want and the level of experience that you are bringing into review? If this is your first entry you need authoritative information and even that needs to be substantiated (there is such a thing as commissioned studies). If you have moved deeper into direct evaluation you may find it useful to be assisted by a guide to reduce risk & distractions. Ultimately the buyer must make a decision and it must address the economics, delivery of business service, transitioning and engagement sustainment.